Android users will now see a bar graph that will show them the time it will take to reach a particular destination, along with other bars at half an hour intervals. 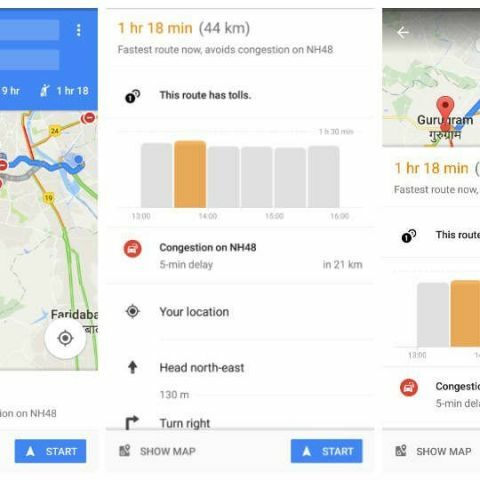 Google has added a travel graph to its Maps app that will give you a rough idea of what would be the best time to leave for any particular destination. Now, when you take a look at the route information, you’ll see a bar graph that will show how long it would take for you to reach a particular destination, along with other bars at half an hour intervals. Above the graph is a dotted line that will let you know the time it would take for you to reach the destination if you left right now. The bar is highlighted green, yellow, or red depending on traffic conditions. The size of the different graphs will give you a rough idea about when you should leave. The feature only seems to be available for Android users right now, and it may be released for iOS later. The idea behind the new feature is that it will help users gauge their departure time. So if the current traffic is high, you might want to wait a bit before leaving. Conversely, if it looks like the traffic is going get worse, you might want to leave right then and there. Right now, you only get to see the time a trip would take if you leave immediately. Hopefully, Google Maps will add an option to see the duration a trip would take at other time periods indicated in the bar graph as well. A few days ago, Google also added Street Views of various filming locations for the Game of Thrones TV series. So if you want to see Winterfell, you should head over to Doune Castle in the Stirling district of central Scotland and at Castle Ward in Northern Ireland. King’s Landing is shot at Dubrovnik, Croatia, while the Dothraki Sea is the Bardenas Reales, a desert located in Northern Spain. Google has details all of of the filming locations on its official blog. If you somehow aren’t aware yet, the first episode of Game of Thrones season 7 was released just a few hours ago and you can watch it on Hotstar. But before you do that, you might want to click here and read our article on what you should know before you start watching the new episode. Do i need to leave my Chromecast plugged in all the time?